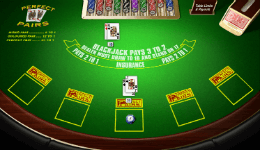 Perfect Pairs blackjack is seen by many as the more exciting variant of Blackjack, even if it is basically a standard casino classic that also offers players a chance to place perfect pairs side bet. 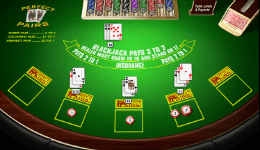 This means that the main gameplay is no different than in any other standard Blackjack game, whereas the perfect pairs side bet when placed applies to the player’s first two cards. Due to perfect pairs payouts going up to 30:1, a far cry from your regular 3:2 blackjack payout, Perfect Pairs game tend to appeal to high stakes blackjack players and those chasing big wins, although it is important to note that the aforementioned side bet features a very high house edge of 4-6%, meaning you would probably be better playing any other blackjack game if you can live without the extra excitement provided by the potential big wins. If you can not, the make sure to check out some of the best Perfect Pair titles below. 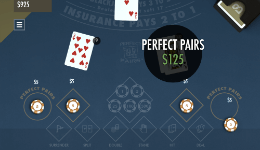 What you need to know if you are thinking about giving Perfect Pairs a try is that perfect pairs side bet can only be placed alongside a standard blackjack wager, with bet limits the same for both parts of your bet. Nevertheless, the two wagers do not have to be the same. USA (RTG) Odds: 99.46% on the basic game. Side bets: 93.9%. Games OS: 99.3% on basic game, 96.63% on side bets. Cryptologic: 99.63 on main game and 94.3 on side bets. Amaya: 99.57% basic and 93.9% on side bets. Please be aware, that the odds decrease with the number of decks (opposite to the main game). 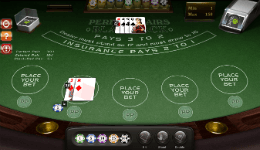 For example if you play the first option with 2 decks, the odds decrease from 94.3% to miserable 75%. As odd as it may sound, the first advice we can give you with regards to Perfect Pairs blackjack games is never to place the side bet if you want to have any chance of turning a profit in the long run. When compared to the standard Blackjack wager, the house edge is significantly higher when side bet is in play, so if you are after best value for money, you should definitely look elsewhere. But, in case you cannot resist the temptation of placing your wagers on markets with potentially high outcomes, then you can improve your chances by staking say $5 per hand on regular wager and another $1 on perfect pairs side bet. Considering that the side bet is always settled first, you need to ensure that its outcome does not affect your standard wager, since you might be tempted to take more risks if you have already lost your side bet and vice versa. With perfect pairs payouts ranging from one casino to the next, you also need to ensure you only play games where perfect pair pays 30 to 1, as the house edge is already high enough even without the lowered payouts.